Come join Scot and Maurine Proctor July 10-24, 2017 on the fantastic Viking River Cruise’s 15-day Grand European Tour. Of all the cruises we have ever done, this was our favorite! And we want you to come with us. Our agents at Morris Murdock Travel have reserved the entire boat (168 passengers!) for this journey so it’s a unique trip where you’ll find many friends of your same values and background. This is rare to have the entire rivers of Europe cruise to ourselves. 15 days, 12 guided tours, four of the most picturesque and romantic countries in Europe including The Netherlands, Germany, Austria and Hungary. You won’t believe it until you do this. Even the stunning pictures below do not do justice to this spectacular, never-to-be-forgotten cruise. Imagine gliding down a river while you pass mountain-top castles, quaint windmills and majestic cathedrals. Stop in the towns along the river that are some of Europe’s most quaint and historic. Experience the beauty and heritage of another world. This journey will take you carelessly floating into the Middle Ages. You’ll love every second of it! Call Wendy Fracchia at Morris Murdock Travel. 801-483-5285. Day 1: Arrive in Amsterdam, then transfer to your ship. After boarding, the afternoon is yours to relax or explore the city on your own. If your schedule permits, you may wish to visit the Anne Frank House, where a brave Jewish girl left her mark on us forever. Stroll along the famed canals and stop and see the museums that feature the famed Dutch masters. Amsterdam is unique in all of Europe and if you have not been, well, you’ll find yourself wanting to come again–and stay longer! Day 2: This morning we sail to Kinderdijk, a UNESCO World Heritage Site, for a tour of this ingenious network of windmills and other flood management devices. You learn why the windmills were built and see how they work, plus you enter a working windmill for a tour of its mechanisms and living quarters. Return aboard for lunch and an enjoyable afternoon of Dutch diversions: sample handcrafted Dutch cheeses and try your hand at sjoelen (Dutch table shuffleboard). If you have any Dutch in your blood you will feel it here! We cruise through the night. Day 3: You have a morning tour of Cologne, including a visit to the Dom, Germany’s largest cathedral and a UNESCO World Heritage Site. Here they claim to have remnants of the bones of the Wisemen who came to visit the Christ Child. No wonder this site has been so popular for centuries. After your tour, spend the rest of the day and evening exploring Cologne on your own: There are Roman ruins, interesting neighborhoods and wonderful museums like the Fragrance Museum and the Chocolate Museum. You really begin here to be immersed in German culture. Day 4: Cruise past hilltop castles along the Rhine, stopping in Koblenz to visit Marksburg Castle, the only Rhine fortress never destroyed. This is one of the cities where Scot served on his mission and he always loves to return here! 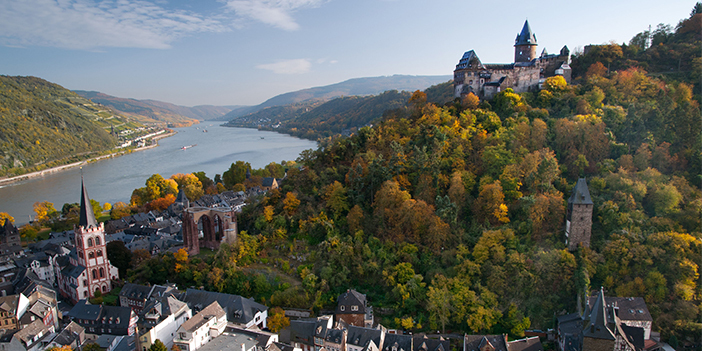 After your tour, continue cruising this stunning stretch of the Rhine, a UNESCO World Heritage Site. Pass the Lorelei Rock, which marks the river’s narrowest point and is named after the legendary Rhine maiden who lured sailors to their demise. You’ll truly fall in love with the Rhine! Day 5: The morning is spent sailing along the beautiful Main (pronounced ‘mine’) River as it winds its way through the Spessart region, home of the actual Snow White. After lunch, we stop in Miltenberg, known for its half-timbered houses and Germany’s oldest inn. Join our walking tour that concludes with free time for you to explore and shop. Back on your ship, learn about the region’s glassblowing traditions during a live demonstration. We sail through the night to Würzburg. Day 6: After breakfast, tour Würzburg’s Bishops’ Residenz, one of Germany’s largest and most ornate baroque palaces and a UNESCO World Heritage Site. You will be amazed at the variety of colors and old-world feelings that display themselves here. Then enjoy scenic afternoon cruising. Or, instead of touring Würzburg, join an optional full-day journey along Germany’s “Romantic Road” to Rothenburg, which features a turreted city wall and impressive Gothic and baroque architecture. Rejoin your ship for dinner. This is a day that will fill you with wonder. Day 7: Sail through the morning; after lunch we visit Bamberg, with its medieval city center, a UNESCO World Heritage Site. Your walking tour includes a visit to the magnificent 11th-century cathedral, reworked in late Romanesque style in the 13th century, and the picturesque city hall built on a tiny island in the middle of a river. Centuries ago those passing through this toll booth in the river would have to pay a “Vieh”–a cow, to pass through. That word is pronounced “Fee”–hence paying a fee to pass. Take some free time to enjoy Bamberg. Day 8: After breakfast, disembark in Nuremberg and visit the ruins of Zeppelin Field, the Nazi parade grounds of the 1930s (this will give you the chills); then see the Palace of Justice, site of the infamous Nuremberg Trials. Spend free time exploring Nuremberg’s Old Town (delightful), or join an optional World War II tour that includes the illuminating Documentation Center Museum. We depart just before dinner. Day 9: Arrive in Regensburg midday. After lunch, tour this wonderfully preserved medieval city, a UNESCO World Heritage Site, including structures dating back to Roman times. Discover many 13th- and 14th-century patrician houses and see the splendid St. Peter’s Cathedral. During free time, visit the Alte Würstküche (Old Sausage Kitchen), Germany’s oldest restaurant. You have to pinch yourself a number of times today to even believe you are seeing such amazing, historic things! Dinner is served aboard before our evening departure. Day 10: Have your cameras ready! Arrive this morning in Passau, at the confluence of the Inn, Ilz and Danube Rivers. Your guided walk along the town’s narrow streets takes you through Old Town and past traditional patrician houses. You’ll see the New Bishop’s Residence and visit the impressive baroque St. Stephen’s Cathedral with its ornate interior. Inside, you are treated to a special concert played on the 17,000-pipe organ (the Mormon Tabernacle Organ has 11,623), considered Europe’s largest church organ. Enjoy lunch aboard your ship, and return to the city for further exploration on your own before departing. We cruise through the night. Day 11: After breakfast, visit the abbey at Melk, a 900-year-old Benedictine monastery featuring Austria’s finest Italian baroque architecture. This place is as beautiful as it looks in the picture. Here you feel a sense of gratitude for all those who preserved religion through the ages in Europe. Rejoin your ship; cruise through the spectacular Wachau Valley this afternoon. Before dinner, you have time to explore the time-honored town of Krems and see the Steiner Tor, the last remaining city gate. Day 12: Today we tour the Austrian capital of Vienna. Ride along the Ringstrasse, which replaced the city walls in the mid-19th century. See some of the city’s baroque architecture, including the world-famous Opera House, St. Stephan’s Cathedral and Hofburg Palace. Return to your ship for lunch. The rest of the day is yours to further explore. You won’t want to leave Vienna without at least trying Wiener Schnitzel, Tafelspitz and, of course, some Apfelstrudel. As always, your Program Director can help you plan your free time. Or you may take an optional tour to Schönbrunn Palace, the “Versailles of Vienna,” erected in 1778 and graced by a number of formal gardens, Grecian statuary, the world’s oldest zoo and Roman ruins. After dinner, relax or enjoy an optional classical concert. Day 13: Enjoy a day at leisure in Vienna. Perhaps see an unrivaled collection of Old Masters and other spectacular art treasures at the Museum of Fine Arts, or visit the Albertina, with the most valuable graphic arts collection in the world. Maybe ride the Riesenrad, the world’s oldest Ferris wheel, or go shopping for high-quality gifts inspired by the turn-of-the-century arts movement. A slice of exquisite sächertorte is a must for any afternoon in Vienna. Later, rejoin your ship and sail for Budapest. Day 14: The Danube River divides Hungary’s capital city into the once separate towns of Buda and Pest (pronounced ‘pesht’). Explore both sides, starting with Pest’s National Opera House and historic Heroes’ Square. In Buda, walk along Castle Hill to Fishermen’s Bastion and Matthias Church. Enjoy lunch aboard your ship, with the rest of the day to explore on your own. Return to your ship for a traditional Hungarian dinner. You will not be disappointed in your visit to this dream-like city. Day 15: After breakfast, disembark and proceed to the airport for your return flight. Prices start at $4,489 per person which includes $225 of pre-paid gratuities. Includes 12 daily shore excusions and all onboard meals. Complimentary Internet service and much more. (Airfare additional) Call Wendy Fracchia at Morris Murdock Travel. 801-483-5285. What is the cost for a solo traveler? That tour sounds fantastic! I live in the Netherlands. In fact, I can bike within 30 minutes to Kinderdijk! You do not want to miss that place! I used to live in Cologne and love the city. There is so much to see! If you cross the river on the passenger bridge (Hohenzollernbrücke) you have a gorgeous view of the Dom. And can see the Rhine. I served my mission in Austria and Vienna is close to my heart. I want to come there with my family once and show them where I walked as a missionary. There is so much culture and music. How much would the cruise be excluding the flight?